iSCSI remote boot 可以透過 MPIO(multipath I/O) 來確保他的連線不會因為單一的網路斷線而失去連線,但是這功能是不是用 teaming (teaming 是一個為通過由多個網卡創建的 team,多張網卡視同一張,可以提供負載平衡 load-balancing,容錯 fault-tolerance 的功能) 一樣就可以解決了.為什麼還會用到 MPIO 這東西. 關於這一點在 Intel 的官方網站文件 Intel® PRO/1000 Server Adapter iSCSI and iSCSI Remote Boot Frequently Asked Questions 有提到,這裡面提到的都屬於硬體的 iSCSI remote boot. Q18: Does Intel iSCSI boot support adapter teaming? A18: Adapter teaming is not supported on ports configured for iSCSI remote boot due to limitations in the OS stack, which does not support teaming for iSCSI traffic. 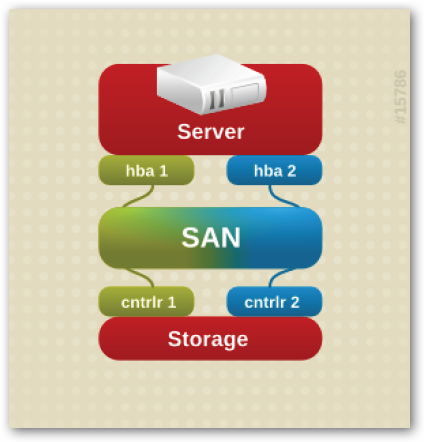 Storage failover and load balancing support is provided by using MPIO. Q16: Is Multipath I/O (MPIO) supported by Intel iSCSI boot? A16: Intel iSCSI boot solutions use the standard OS iSCSI boot initiators to provide remote boot support, so MPIO and other advanced features are supported for iSCSI boot via the OS initiator once the OS boots. 上面兩個問題提到了一點 " iSCSI remote boot(系統支援由 iSCSI SAN 遠端開機)" 因為 OS 無法在開機時就支援 teaming 所以如果要確保網路品質建議使用 MPIO 這一項功能(需要硬體的 iSCSI 網卡),但是問題二卻談到了目前 Intel 的網卡是否支援 iSCSI MPIO Boot 的功能.答案是不支援.雖然我們在設定 Intel iSCSI Boot 可以選擇 Primary 以及 Secondary 但這不代表這就是支援 MPIO.以 Intel iSCSI NIC 的規則是如果 Primary 的設定連接失敗時才會使用 Secondary 的設定值,也因此這兩路徑不會同時存在. 現在我們就來看看如何做到 MPIO 的功能.不過到目前為止我都還沒試成過以硬體的 iSCSI 網卡加上 MPIO 的功能開機成功. 下面的例子是在 RHEL5 作業環境下以一般軟體式的 iSCSI Initiator + MPIO. iscsiadm 主要會在 /var/lib/iscsi/ifaces 目錄下面建立剛剛所設定的 iface 裝置, iscsiadm 會依據這邊的設定同時向 iSCSI Target 建立連線. 當我們只要透過 iscsiadm 這一支程式去向 iSCSI Target 端建立連線時,要特別去指定剛剛我們建立好的 iSCSI interfaces (iface) binding 裝置,這樣就可以讓 iSCSI Initiator 和 iSCSI Target 端建立多條連線. "iqn.2009-4.tw.benjr:storage" 這就是192.8.1.55:3260 iSCSI Target 的 iqn. DM(Device-Mapper) multipath 的設定檔儲存在 /etc/multipath.conf ,我們只需要將系統預設的 blacklist – devnode,將他用 "#"註解掉.讓系統自己來偵測即可. DM(Device-Mapper) multipath 的服務名稱為 multipathd ,開機啟動時設定 chkconfig ,立即啟用服務使用 service 程式. 當我將 "multipathd" 的服務啟動之後使用 multipath 指定來觀看可以發現剛剛由 iSCSI Initiator 連線所建立出來的 2 顆硬碟已經其實是指向同一個 SCSI ID 而 DM-Multipath 也確認的出來. 我們也可以透過指令 scsi_id 來檢視硬碟裝置的 ID 是否相同. 我們透過系統就可以觀看到 /dev/dm 的裝置了.這個裝置就如同一般的硬碟裝置,如同 /dev/sda 你可以針對他做分割,格式化,讀寫等動作.而且還具備 MPIO 的功能. 如果系統沒有自動產生 /dev/dm 的裝置時可以透過程式 kpartx 來產生. 但是在正常ESX 下 Host OS iscsi initiator (VM Kernel ) 單一 (不同於 硬體Lan card ip initiator ) .並且也只會掛一個 iscsi 儲存裝置 (target) . 除非想切成 2個iscsi target . Is Multipath I/O (MPIO) supported by Intel iSCSI boot? 上面問題提到了一點目前 Intel 的網卡是否支援 iSCSI MPIO Boot 的功能.答案是不支援.雖然我們在設定 Intel iSCSI Boot 可以選擇 Primary 以及 Secondary 但這不代表這就是支援 MPIO.以 Intel iSCSI NIC 的規則是如果 Primary 的設定連接失敗時才會使用 Secondary 的設定值,也因此這兩路徑不會同時存在.